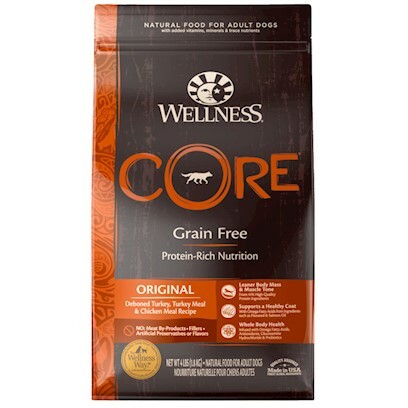 Wellness CORE is based on the nutritional philosophy that pets, based on their primal ancestry, thrive on a diet mainly comprised of meat. Each formula is packed with a high concentration of quality animal protein, without fillers or grains, along with a proprietary blend of botanicals and nutritional supplements. This unique, grain-free recipe supports and nurtures your pet's insidetheir essencetheir core. To create a protein-focused diet the Wellness Way, we carefully control the quality and quantity of the ingredients we use, and pay close attention to the individual properties of each inclusion. From source to bowl, we make no exceptions! If you are looking for a food with more meat and no grains, CORE is truly a more thoughtful alternative. This diet delivers the meat content you're looking for, while creating a balanced profile of high quality, natural ingredients appropriate for everyday feeding. Supporting your pet's inner wellbeing. 115+ add 1/4 per additional 10 lbs.